Photo by Mark Higgins, circulated by NetPosse.com. Roundup Mt. fire in Montana, June 2012. This photo gives me the chills every time I look at it. Living in southern California my whole life, I’ve done my share of evacuations due to wildfire. Luckily I’ve never faced a situation so desperate that required setting horses free to fend for themselves. But these recent fires in Colorado and Montana are a stark reminder that every horse owner needs to be prepared for an emergency. If you don’t already have them, you may want to consider these disaster prep ideas. Be ready before a disaster happens. Horse’s name and detailed description, including photos. Breed, height, coloring, markings, brands, tattoos, scars. Photos will help non-horsey people ID your horse (not everyone knows what a blaze or a pastern is). Your name and contact information. A backup contact person in case you are incapacitated or unavailable. 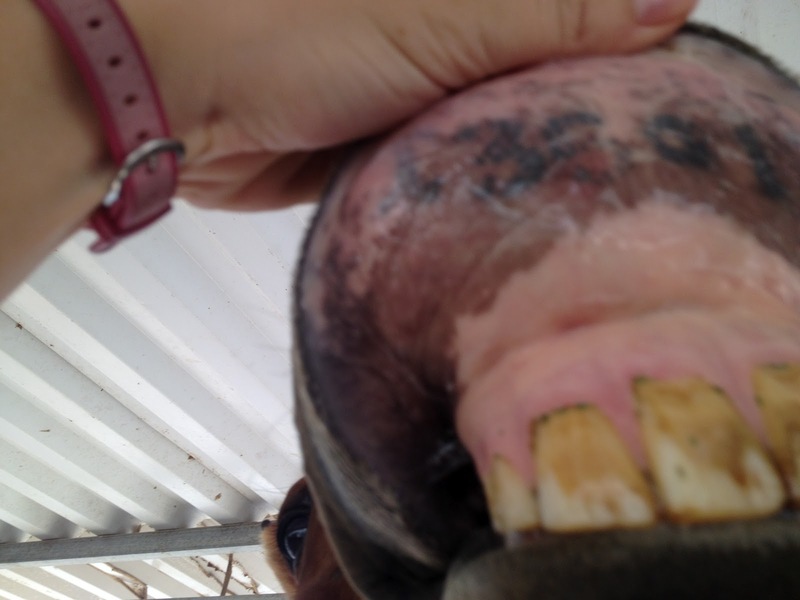 Horse’s medical history information – allergies, conditions, medications, etc. Have multiple copies of this sheet. It should be kept at your boarding facility, and taken in the trailer with you when you travel. Present it to your horse-sitters when you are out of town. Give it to your family members, just in case. Save it on your computer so can post it online or email out, if necessary. When trailering, or in the event of needing to turn a horse free in an emergency, having ID info physically attached to the horse can save a lot of time, headache, and heartache. Put an ID tag with your phone number on your daily halter (and trailering halter, if different). I’m personally a believer in leather, as it will break if the horse gets caught somehow. You can also buy a small dog collar to put around the pastern or fetlock with, and either get a name plate or ID tag with your phone number on it. Also, good to have on your bridle as well, just in case you ever get in a “loose horse” situation. Another way to attach your contact information to your horse is to have an ID tag that you braid into the mane or tail with a shoelace or something. You don’t want to wrap anything around the tailbone, as that could cut off circulation. You could even slice up an old tail bag and use sharpie to write on that. Have this always at the ready and nearby your horse. There are commercial products available, but you could probably make something just as good. Horse and Man Blog even came up with the idea of using twistie-ties and those little store key-chain plastics with the barcodes. In a pinch, that’ll let you describe your horse, and help ID you as the owner. 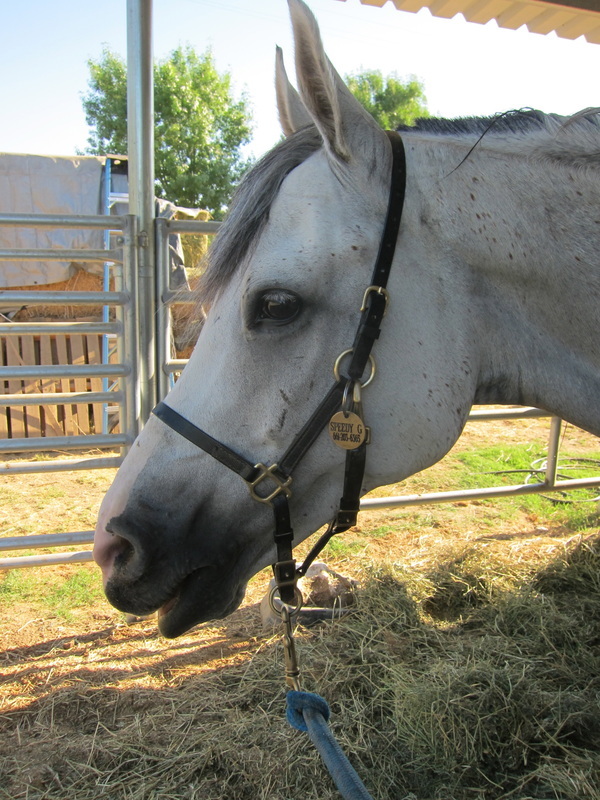 When Miss Paint got evacuated last summer from Santa Barbara, the ranch in Buelleton that housed all the evacuated horses put neck collars, sometimes referred to as broodmare collars (often used at big breeding farms where the mares are all out in pasture), on all the horses to inventory them. You can order them online and have them at the ready. 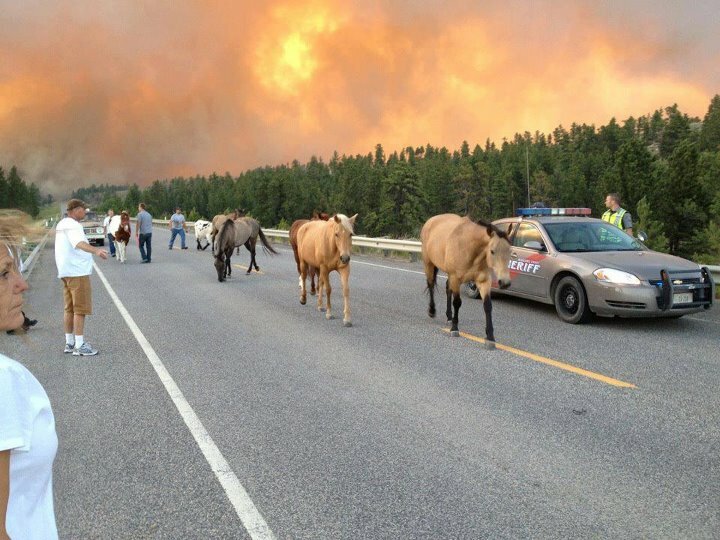 When evacuating a horse or setting them loose due to fire specifically (versus hurricane, tornado, or other disaster), some people are concerned about items attached to the horse getting hot or catching fire and burning the horse. For example, the metal parts of the halter scorching the horse’s face, or the leather catching fire or melting. BUT, remember that hair is highly flammable, and that your horse’s entire body is covered with it. If your horse is close enough to the fire that the leather halter, tail tag, or fetlock band has a reaction, your horse’s mane and coat would be catching fire as well. So that is something that each individual owner will have to decide for themselves. Preferred by people who don’t want physical items attached to the horse, livestock crayons allow you to write info or draw patterns on your horse’s body. Phone number, owner name, barn name, even just a unique marking to ID the horse later, can help you be reunited with your horse. Order these online at Hamby Dairy Supply – I’m sure there are other places. Less than $5 each – cheap, fast, and can’t fall off. Microchips are available for horses just like for dogs. They are inserted into the neck, near the crest about half-way between ears and withers. Your vet would have to install one, or you can order and inject yourself with a kit. Several options are available from NetPosse.com. Could be useful in proving you own a horse, but not super effective in having a horse returned to you: micro-chipping horses is not very widespread, so it is unlikely that rescues or good Samaritans would call a vet out to scan found horses on the off-chance they are chipped. Iris and retinal scanning is still a recent phenomenon, only available through certain vets. After researching at EyeD.com and doing some general googling, the problem with this approach is that it is not widespread enough. If a rescue group finds 5 loose horses, they aren’t going to call out an expensive vet to scan a bunch of horses on the off chance that one has its scan on file. In fact, they wouldn’t know *which* vet to call, as there isn’t even a database of vets that have this equipment! Maybe in the future this use will be more widespread, but for now I don’t think that having your horse’s iris scanned is going to increase its chances of being returned to you in an emergency situation. Tattoos and brands, on the other hand, are visible and identifiable even by non-horsey people. They can help you ID your horse, but they wont help someone discover you are the horse’s owner unless and contact you unless (A) the brand or tattoo can be quickly linked with an organization such as a breed association, AND (B) your information is registered with that organization. I’m working on getting my info registered with the Jockey Club since Hemie has his racing tattoo. Go ahead, look a gift horse in the mouth. Hope everyone will take a minute to make sure they have an emergency plan in place! Our horses are too precious not to. I hope to never have an emergency where my horse is set loose, but I hope I am prepared. I do several of the things you describe: all of my halters, blankets, and trail bridles sport ID tags. By the way, I did need this one time. Many years ago, my mare and I had a head on crash with a motorcycle in a very narrow canyon. She went straight up and pivoted and ran out of the canyon dumping me in the process. The motorcyclist had me hop on back and we went looking for her. Eventually we found her near the highway where she'd been caught by a local resident. Not knowing whether I was okay or not, he had seen the ID tag and called my house as well as search and rescue. Fortunately I was able to find them before getting the message at home, but it was proof to me that the ID tags do work. I also have an emergency sheet hanging in the barn that lists every number I can be reached at as well as three or four other emergency contacts. The sheet of paper also lists other people's names who can authorize treatment in the event that I am unreachable. Several years ago I was boarding at a different place. A horse colicked but no one could reach the owner. The vet didn't want to treat the horse without authorization. He finally agreed to treat the horse since he knew me. My emergency sheet also lists my vet's name and number as well as my horses' names, ages, breed, and vaccination status. My emergency stuff is really for when I am not there. I don't know that I have a good plan for an evacuation. One more story about that. A few years ago, there was a big grass fire across the street from the barn. It was blowing in the barn's direction and coming fast so the barn owner called me. Hubby and I zipped over and were there within a minute. The firefighters couldn't let us pass though since the fire had jumped the road. We drove around the back side of the property and climbed through the fence. My plan was to load horses in my trailer to evacuate if need be. It was only then that I realized I had forgotten to bring my truck keys! My truck is always hooked up to my trailer and resides at the barn. Oops! So again, my evacuation plan needs some work! Thanks for sharing and getting people to think about it. By the way, I now keep a spare set of keys in my barn owner's house to which I have a key!